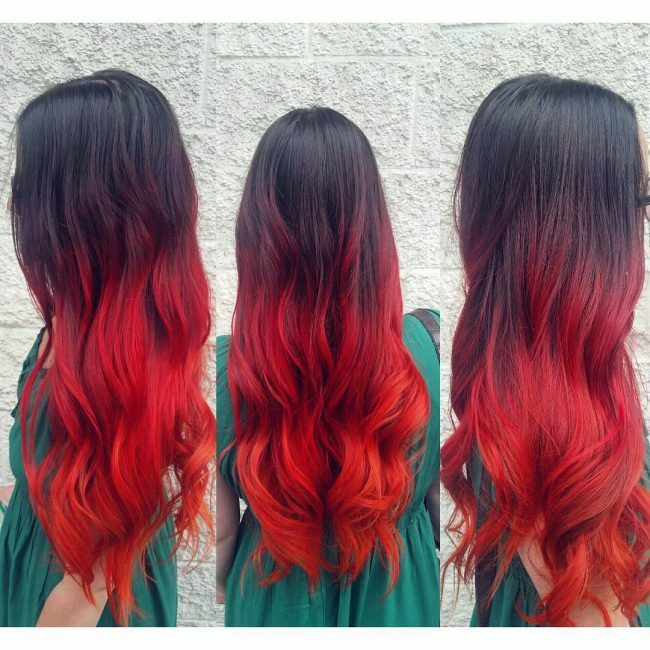 Most ladies use red ombre to draw more attention to their hairdos or to give their daily style a fresh appearance. 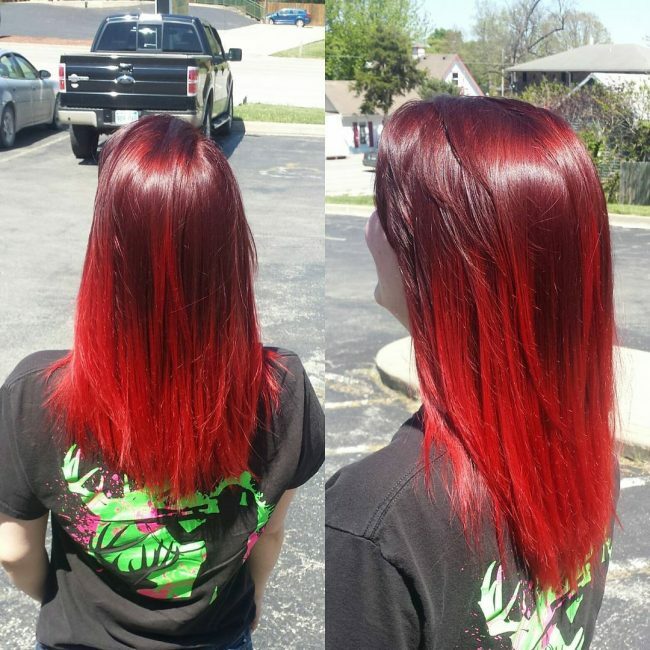 Although it is still a typical ombre dye job red is a unique shade in many ways. It works perfectly with all shades regardless of whether they are dull or bright. And it also comes in several shades and hence giving you the opportunity to choose a hue that conforms to your preferences. 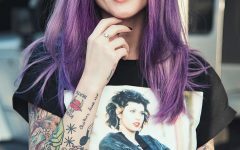 Although the options are endless when it comes to this modern hairdo, the following 30 styles will give you enough inspiration on what you can try out. 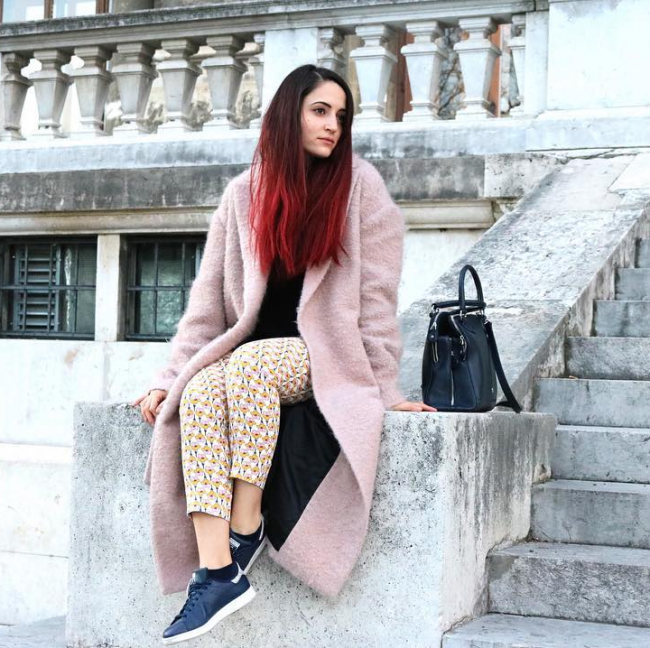 The brightness of this hairdo and the pattern that the colors take makes it hard to know that the hue on the tips is Rose Gold. 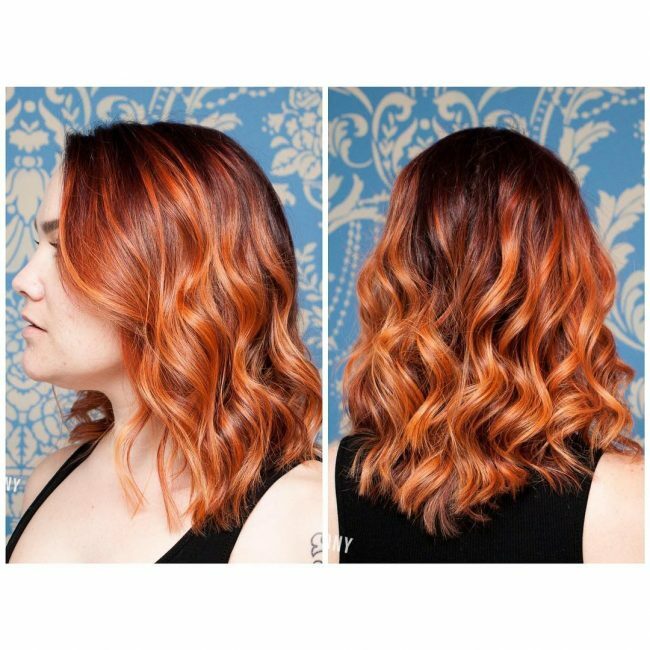 When the rose gold gets a hint of red, it looks orange, and this helps to create an eye-catching ombre pattern. The strands also have some cute waves and a simple side part styling. 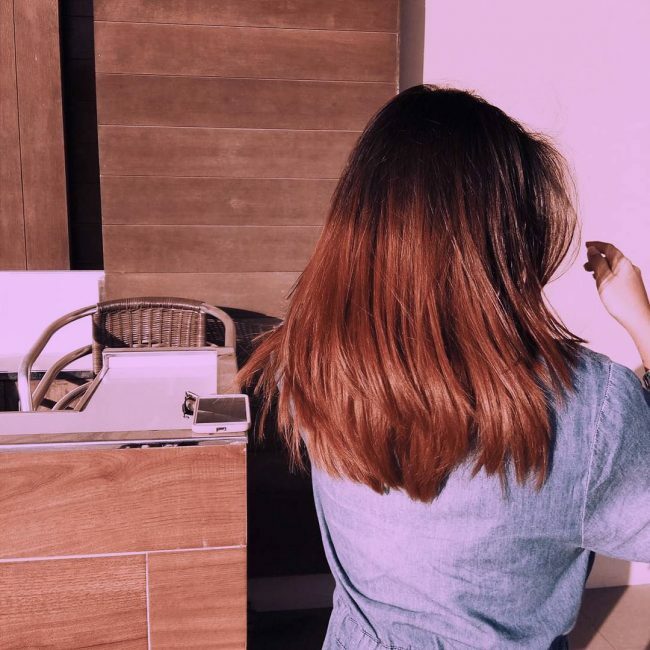 This hairdo is still a red ombre design although it looks very brownish. The brownish appearance comes from the fact that it has different shades of brown that blend into the design. 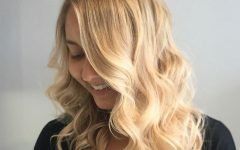 However, it still maintains the elegant contrast that comes from transitioning drastically from a dark base to lighter ends. The transition between the different shades on this headdress is not very noticeable because it is a soft ombre. It starts with a black base and then incorporates a dark burgundy shade to give it some color. You should then brighten the resultant tones towards the tips to finish your look. Although you can have it with any hair, it looks fantastic with choppy and wavy locks like these. This headdress is as typical as it can get and it involves a drastic transition from a black to a bright burgundy hue. The contrast between these twos shades is what makes this a top notch design. Apart from this the locks also have a lovely shine and some fancy waves that also help to spice up the look. Elegant and trendy are the two words that best describe this hairstyle. The color is what makes it look this charming and it comes from mixing ginger and copper. 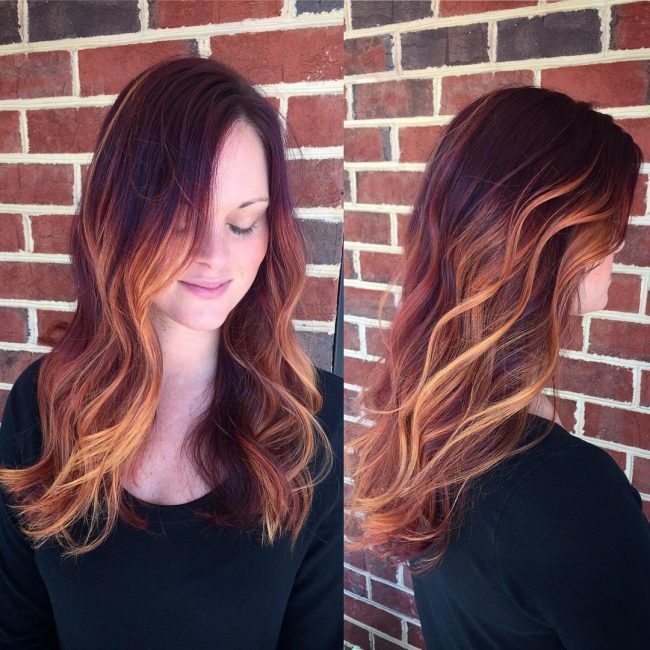 It starts with a dark base hue and then transitions to the sweet blend of copper and ginger. Apart from the tone the strands also have an incredible blunt cut that makes the smooth and straight locks look adorable. Most current dye jobs are hand painted because this gives your strands a natural finish. 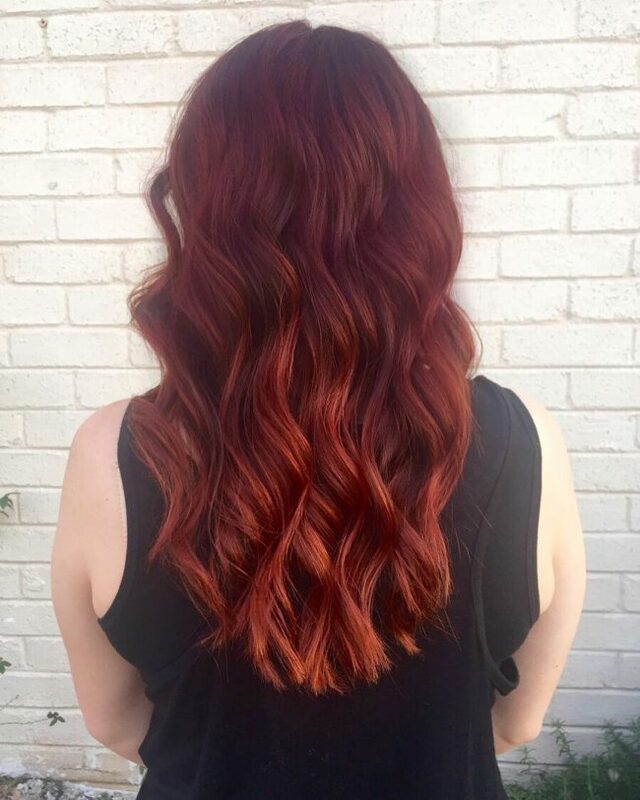 In this design, the balayage is what makes all the difference and it involves painting the locks with copper and mahogany red. The copper forms the base, and it transitions smoothly to the mahogany to make the textured curls look very classy. 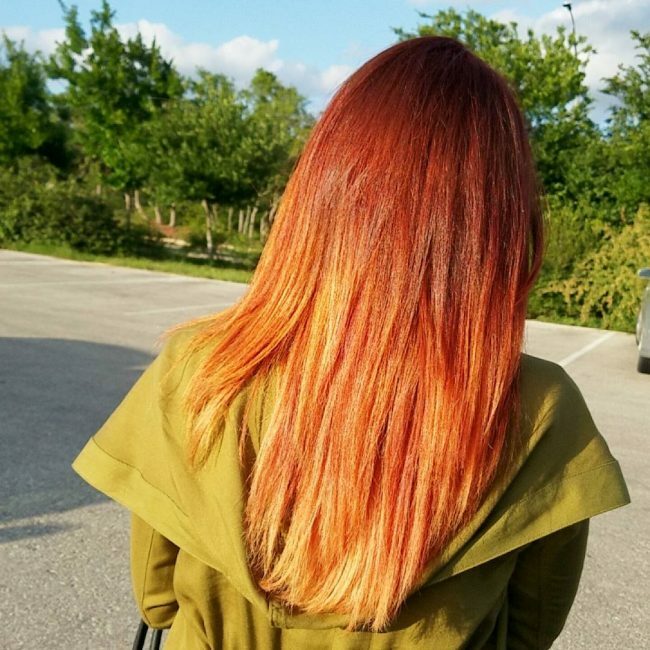 Although this is a typical soft ombre dye job the introduction of the partial streaks to the design makes it look distinct. After getting the transition from the red shade to lighter ends, you should create some partial light brown highlights to give it some extra depth and dimension. These straight and chunky strands have a vibrant tone that gives them an appealing look. 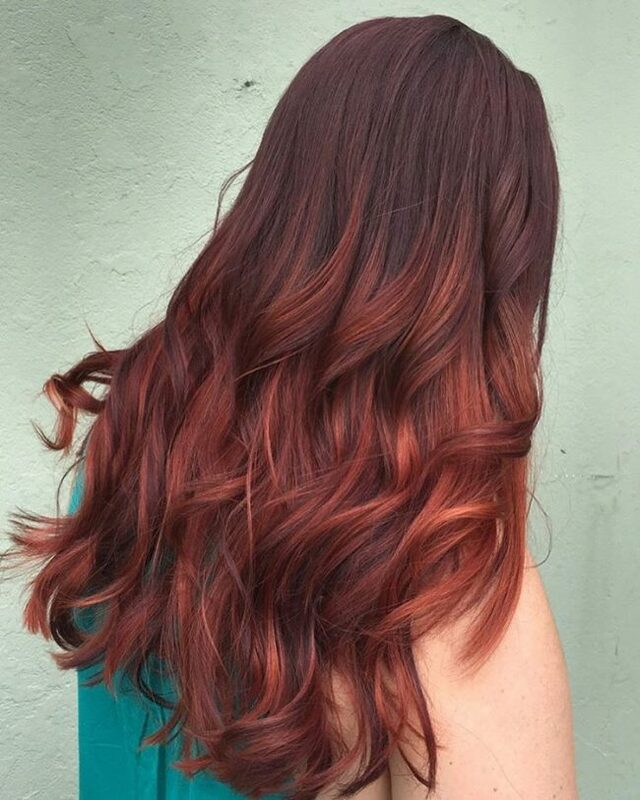 The color design involves transitioning from a dark red tone to a blend of orange and brown. Although the contrast between the shades is not very evident, these smooth strands still look vibrant. Ladies with long wavy locks should wear this design because it is not only very straightforward but also elegant. 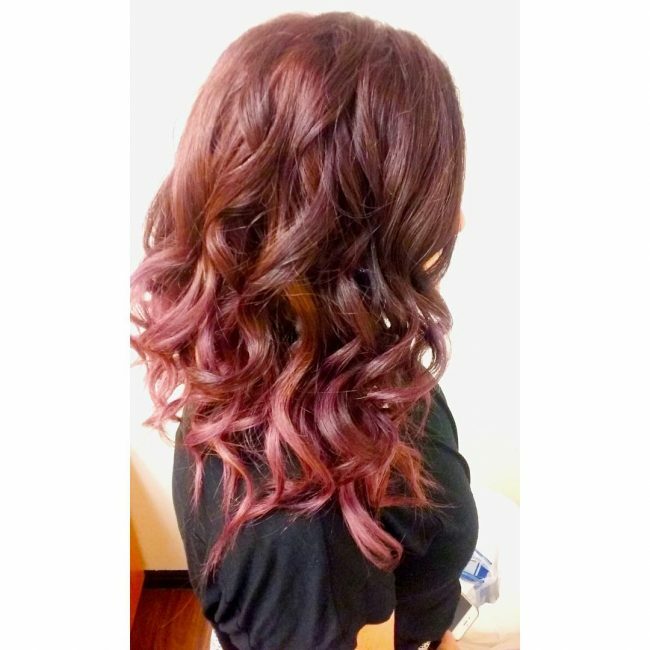 You should start with a dark burgundy shade and then transition it to a red hue to create your classy ombre look. For styling, you should create a center part and push the locks sideways to create a face frame-like design. This headdress looks very classy because the long locks have some beautiful waves and length but their color is what makes the design stand out. 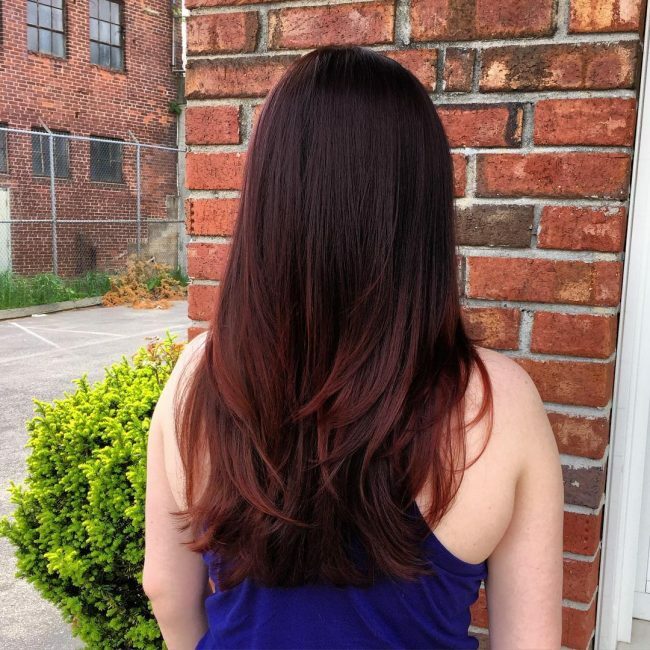 The lovely tone comes from a smooth transition from a black base to a blend of red and chocolate brown. And the strands also have a subtle shine that gives them some class and a modern appearance. You cannot misinterpret the intentions of the wearer when she was getting this style because the outcome is very clear. And so if you want to get the ultimate bold expressions you should replicate this headdress. 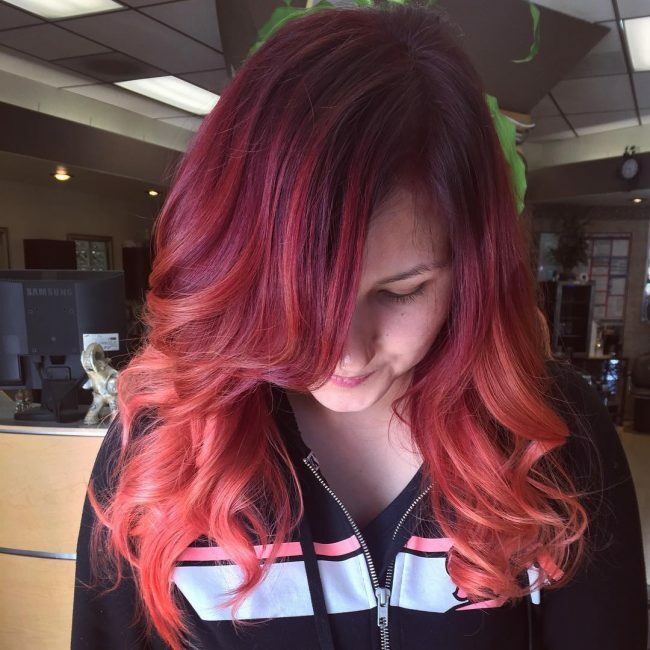 This fiery style starts with a black shade before transitioning to a red tone and finishing by fading it into an orange fade. The brushed out curls with a perfect texture also add some detail to the colors. 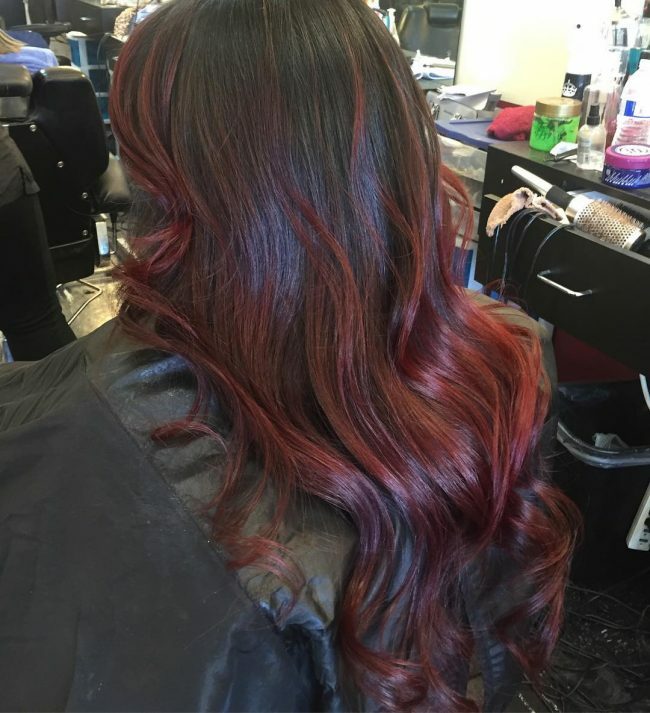 This gorgeous dark burgundy ombre design is exceptional in many ways. 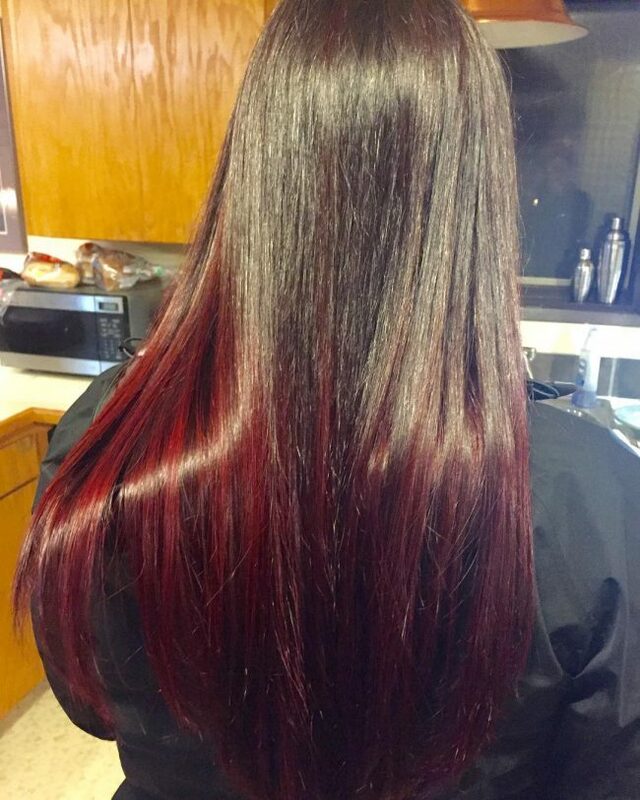 Its contrast comes from darkening the roots slightly, but most of the hair has a uniform burgundy hue. However, the center part styling helps to expose the dark roots for some contrast. The locks also have some lovely curls and a perfect volume that enhances their appearance. There are various shades in this design, and so it is not easy to tell which one makes it stand out but most people will agree that each one of them has a role to play. The most dominant one is the ginger blonde that has some light brown streaks. 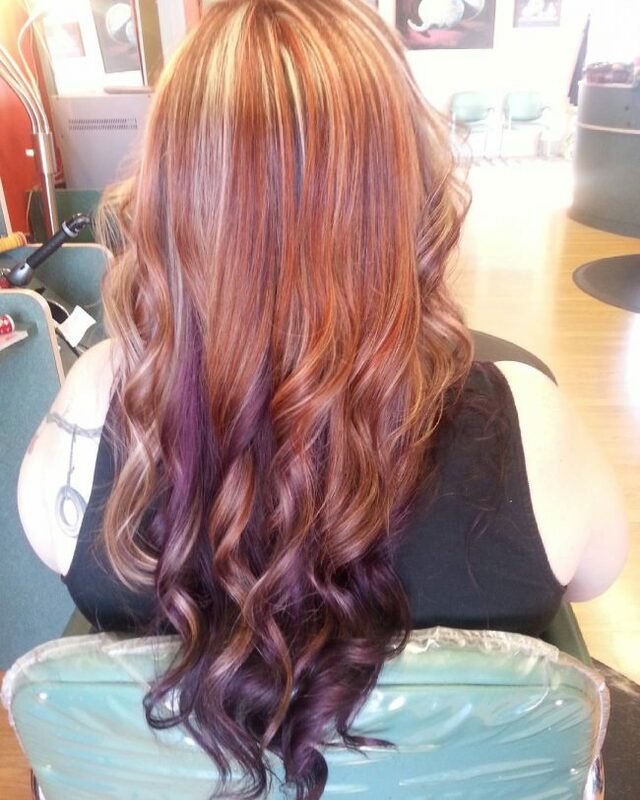 However, the long curly locks also have a purple peek-a-boo shade that adds a twist to the look. The balayage is what forms the base color for this headdress. And it comes from hand painting a blonde hue on a dark brown natural hair. 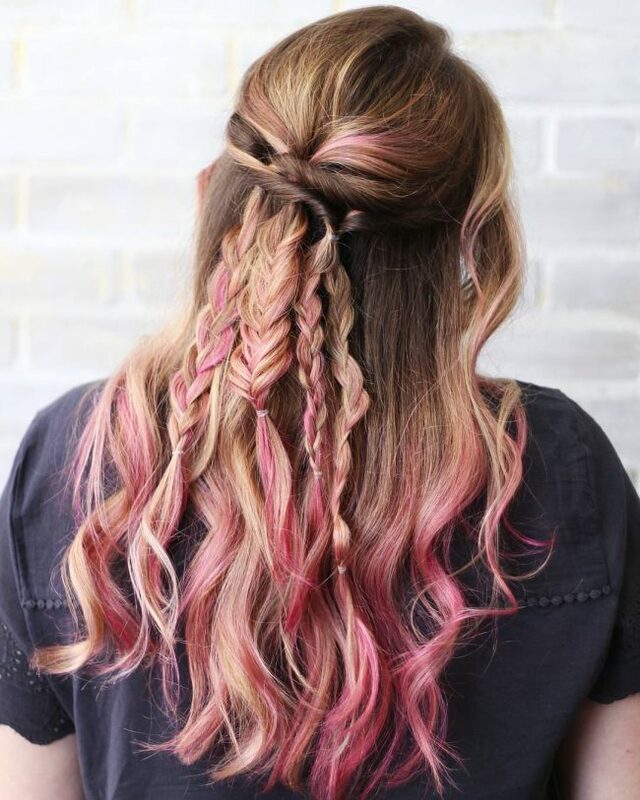 You should then introduce some partial pink highlights to the style using foils and then finish your style by braiding a few strands to create the four fancy braids at the back. It is also a good idea to tie the braids to create some fishtails. Purple and red blend in this design to give the textured swirls and excellent shade. Although this is still a typical ombre design, it is not easy to see the transition between the colors and the contrast because the two shades blend in perfectly. For styling, you should stack the strands by pushing them back and make them slightly messy so that they can have a natural look. 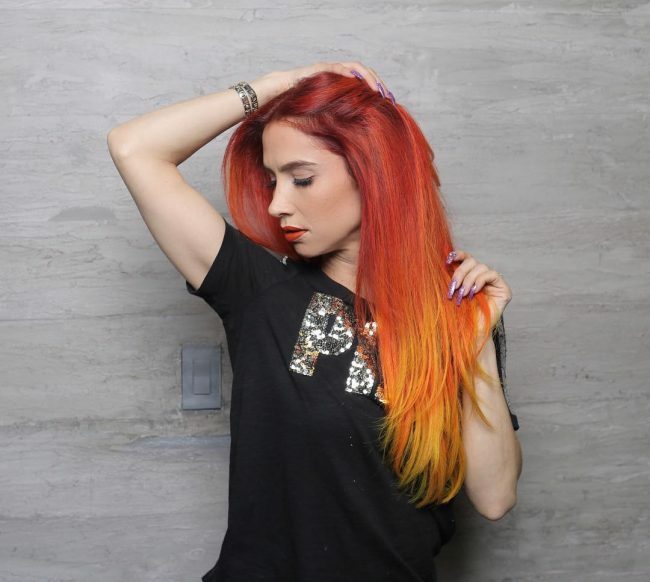 If you are one of the many ladies that love bright looks, this hairdo will be perfect for you. Its dazzle is head-turning, and it is impossible for anybody not to notice you. The tone comes from transitioning from a bright red hue to orange. Although the change in shade is very gradual, it still creates a cool ombre pattern. The long locks in this design are splendid not only due to their length but also because of the textured curls. Their color is also top notch, and it is what sets them apart from other styles. To replicate the shade, you should start with a black base and transition drastically to a blend of orange and red. You should then style your strands with a center part and side sweep. This headdress is ideal for ladies who like to keep short stylish hairdos. It involves chopping your strands short to create an angular face-framing bob. 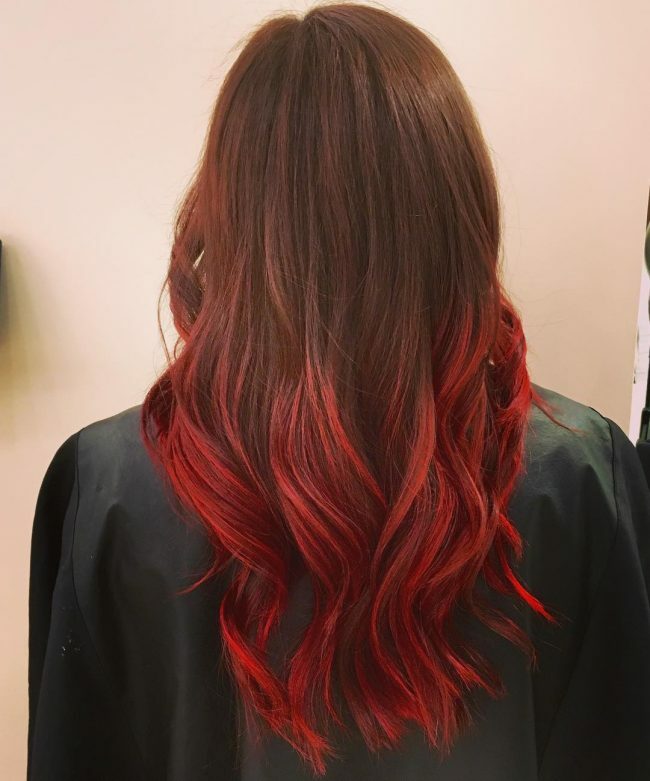 Although it has some nice smooth strands, its color is what makes it stand out and it is an ombre that transitions from a black base color to a dark burgundy. Versatility is one of the things that make red a favorite shade, and this versatility comes from the fact that it has numerous shades. 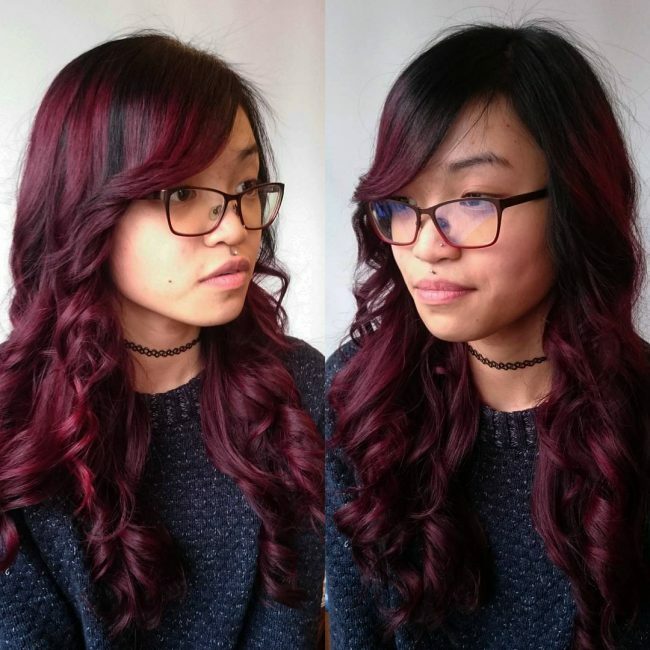 This style uses a red wine hue to make some long textured locks look exquisite. The locks also have other hues such a chocolate brown, and you should hand-paint them on the red wine to create an ombre pattern. Long bobs are very stylish but even if you cut yours correctly you still need some nice color for it to look magnificent. This particular one gets a fiery red tone but what makes it look brilliant is the fact that it has a black base, and this creates an incredible contrast. The Lob also has some nice textured locks and an excellent volume. Copper is a lovely tone that can spice up and brighten any look to make a woman look elegant. If you combine it with a burgundy shade like in this design in an ombre pattern, you will get a top notch headdress that will make your wavy hair look very refined. And if you have a black base you will also get an adorable contrast from the peeking dark shade. The locks on this style may be very short but they still look magnificent, and this is due to the color choice and pattern. These strands have an eye-catching ginger ombre color design that will make you look very fashionable. 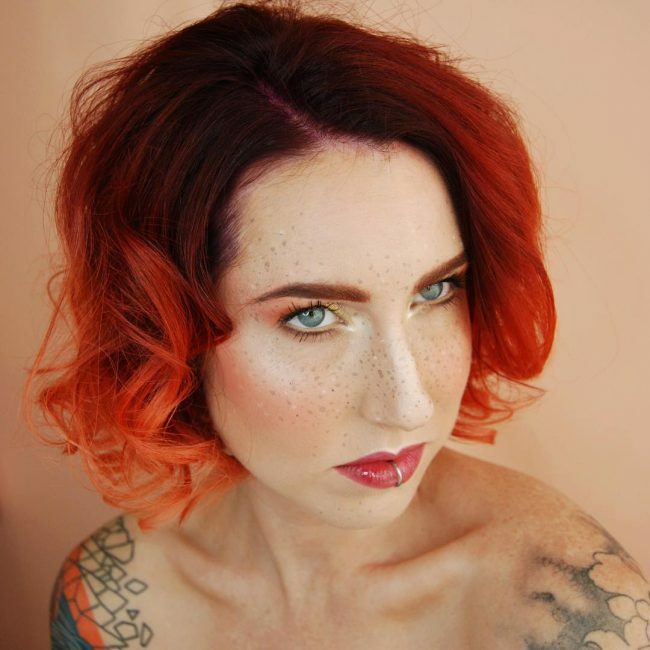 To wear this look, you only need to darken your roots and then give the rest of the strands a reddish ginger shade. You should finish with a center part to expose the dark roots so as to bring out the contrast in your colors. The shine on these hairs is nothing short of perfect, and it makes the long straight locks look healthy. 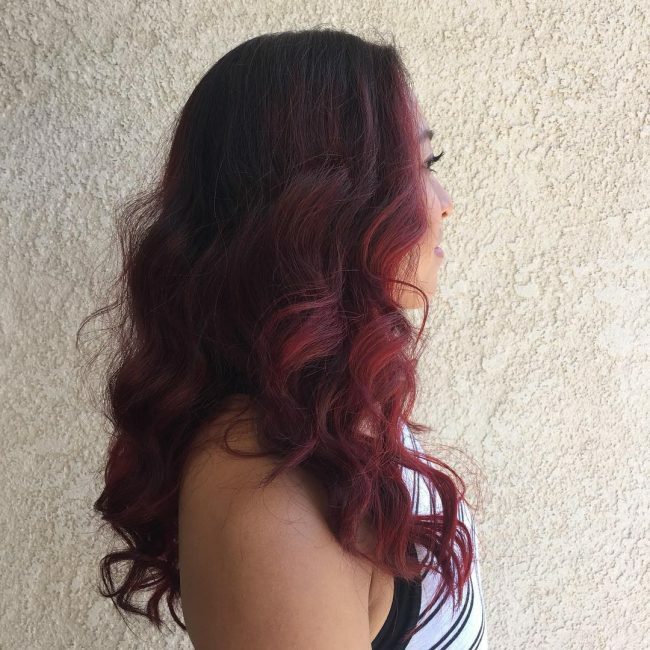 However, they also have a fantastic color that comes from transitioning from a black natural base hue to burgundy on the tips, and this creates a vibrant sombre pattern. 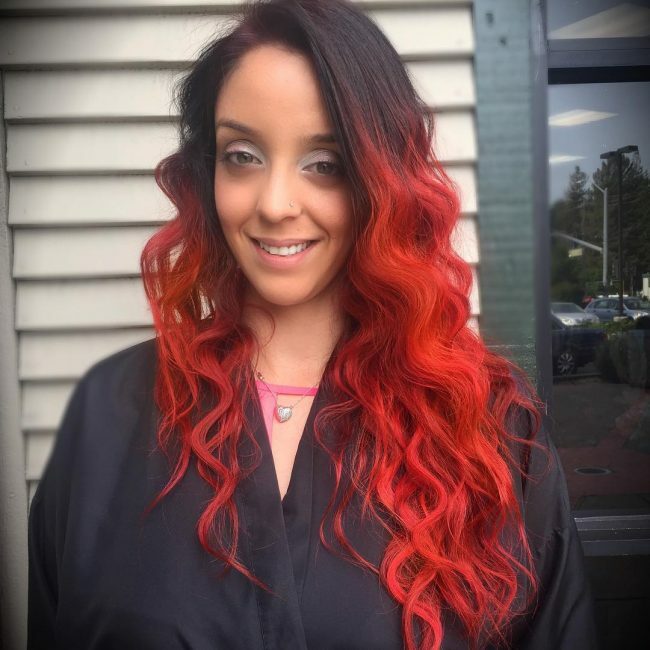 Color melting is an easy way to give your strands a distinct shade and it this design it is responsible for all the beauty. 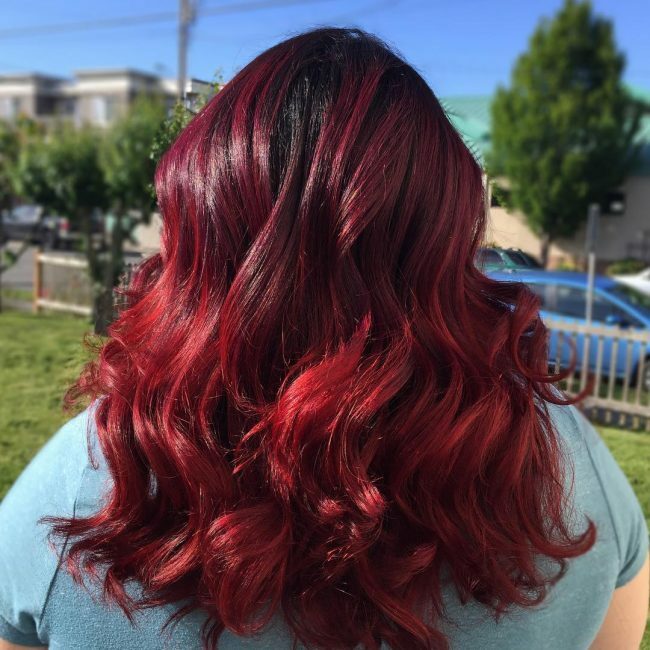 Different shades of brown melt in with red to create a unique shade and you should have it in an ombre pattern by making the base darker. Having blunt and textured locks is also a good idea as it will help to spice up the look. You can also go for a multidimensional look by using different hues in your hair to create a charming headdress. To create this look, you should combine red and burgundy on a black base and in an ombre pattern. Having some voluminous locks and styling them by layering will also make your hues detailed and hence more attractive. Nothing beats a natural looking headdress like this one. And what makes it look unique is its dark tone that comes from blending a dark burgundy shade into a black base. 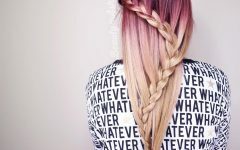 Apart from the color choice the hues also have a cool ombre pattern, and you should style them by stacking with a brush back. 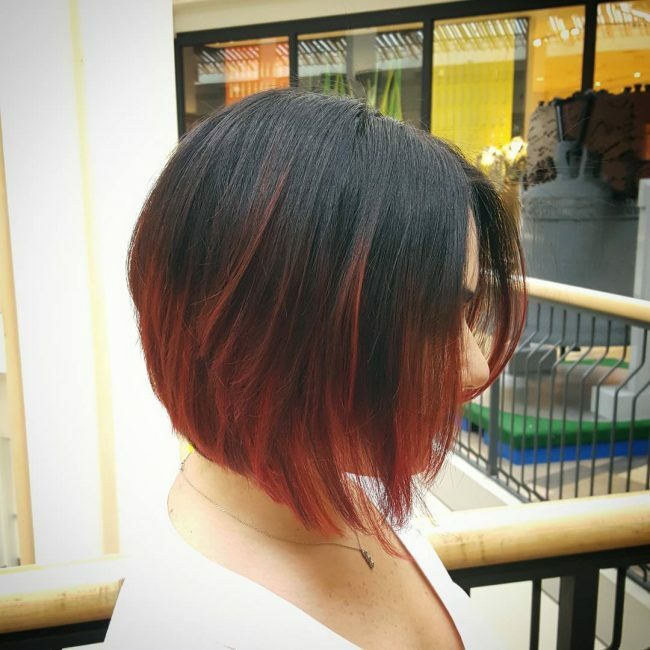 The cut and style of this A-line Bob are fantastic, and they make it look outstanding. It also has a lovely fringe nd that gives it an excellent definition. Apart from the cut and the styling the shade is also perfect and it has a classy wine shade with bright copper peek-a-boos. 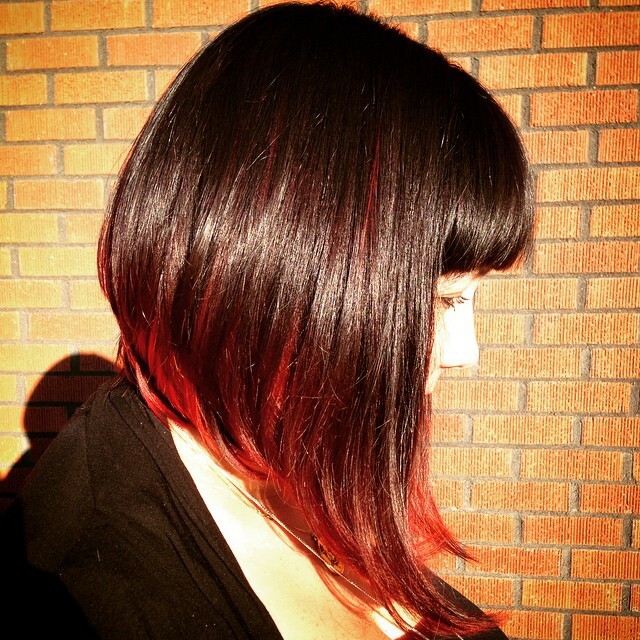 Adding a bright hue to your black hair will make it look stunning and modern. However, you still need to know the right hues to use and how to dye it. If you want it to look as polished as this one you should use a bright cherry or burgundy. You should start with a copper base and then transition to the bright cherry shade to finish your fabulous color pattern. Although you can still create this look with wavy or curly hair you should go with straight one for some depth. 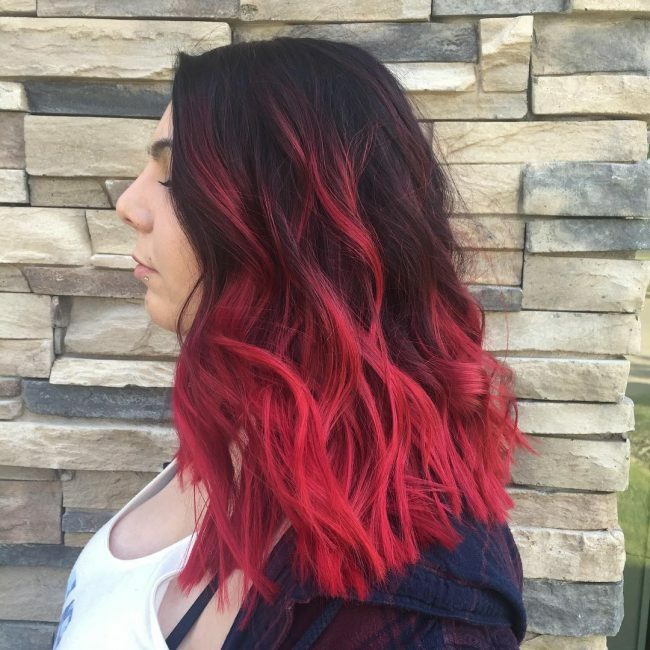 You do not have to create a complicated color pattern to stand out since you can still look elegant with a straightforward ombre design. Here the color transitions from a black base to dark red to create an appealing tone. The long locks also have a nice texture, and some brushed out curls that also spice it up. The transition between the bright tones in this design is eye-catching, and it shows that the stylist was very precise with the placement of the colors. 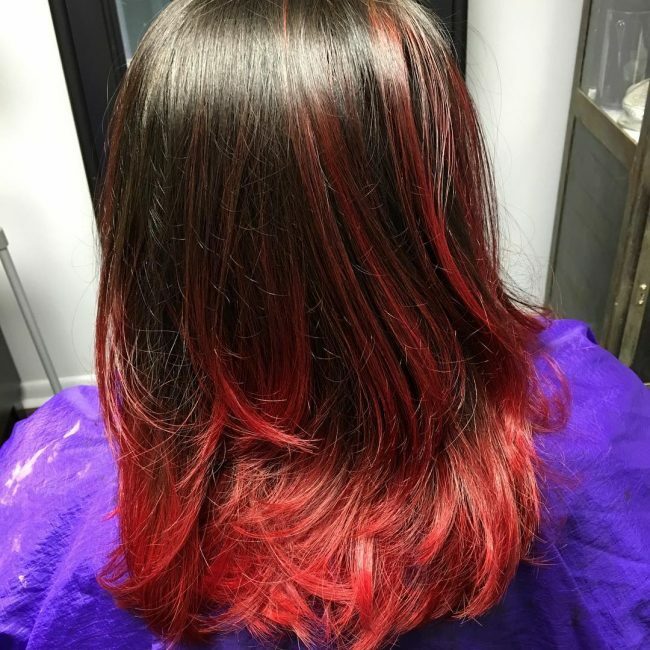 It starts with a blend of copper and red before transitioning to an orange hue. 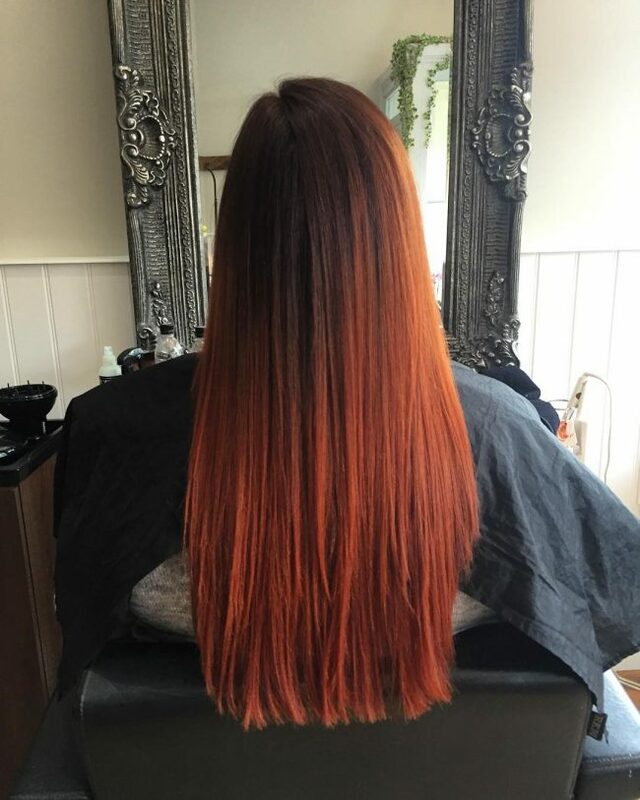 You should then fade the orange so that it appears brighter on the tips. 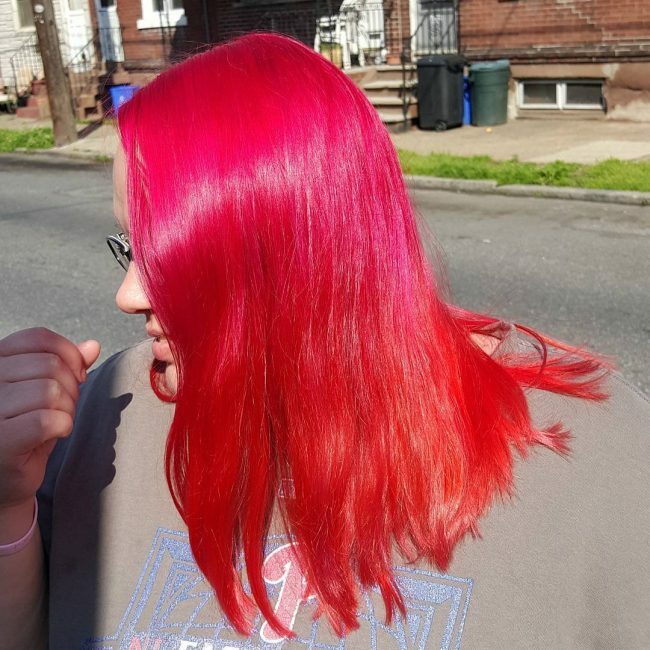 Red ombre dye job is an easy way to give your strands a fashionable shade, and the good thing is that there are very many designs and color combinations that you can use. Whether you prefer dazzling looks or dull ones you still have many options with this hairdo. And if the 30 style above will not work for you by any chance, they will still give you some ideas on what you can wear.